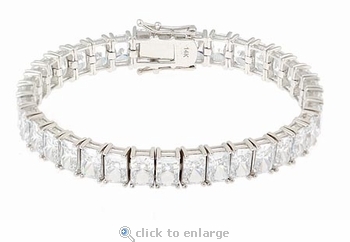 The Parisian Emerald Radiant Cut 1 Carat Each Cubic Zirconia Tennis Bracelet will reveal a romantic feeling of distinction. Each basket set 1 carat 7x5mm emerald radiant cut high quality diamond look cubic zirconia adds up to a total weight of approximately 36 carats of the finest hand cut and hand polished original Russian formula cubic zirconia. 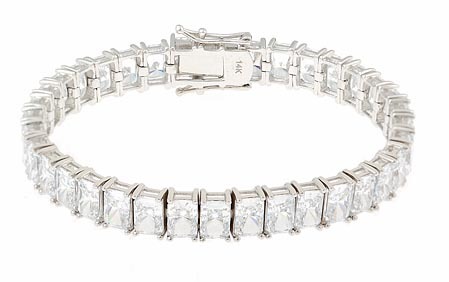 Just over a quarter inch wide, this cubic zirconia bracelet comes standard at 7 inches long and is secured with a double hinged clasp. An upgrade to 8 inches is available in addition to your choice of an Emerald Radiant Cut cubic zirconia with 104 facets as featured or the traditional Emerald Step Cut cubic zirconia with 27 facets. A matching tennis style necklace is also available, please see item N1076. Choose from 14k white gold, 14k yellow gold or luxurious platinum. Please see the pull down menu for options. For further assistance, please contact us directly at 1-866-942-6663 or visit us via live chat and speak with a knowledgeable representative.